In 2011 on Oxford Street, London's principal shopping street, a protest against the massive tax avoidance of large corporations was in full swing. 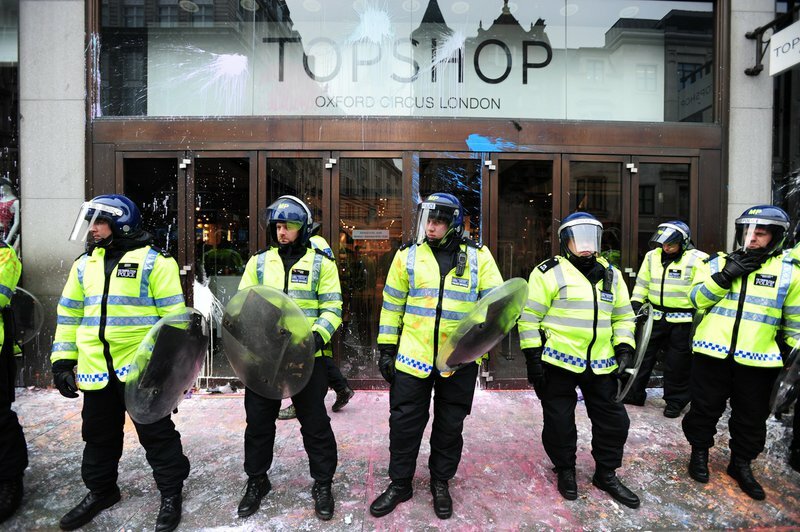 Top Shop had been covered in paint, with riot police left standing in formation around its door. People roamed joyously, anarchically, angrily, up and down the traffic-freed roads: the UK's budget deficit stood at £121 billion, Britain was being exhorted to be austere, jobs were being lost and current cuts to public spending loomed. The familiar cry of "Whose streets? Our streets!" rang out. Throughout central London the police formed cordons to contain, to control. The crowd rearranged itself, people were pushed in and out of small spaces, dodging to avoid being trapped for hours. A small flock of Robin Hoods weaved in and out of police lines complete with feathers in their caps. A crunch point: a group of people being pushed backwards by policewomen and men, responding with what in the circumstances was an extraordinary claim: "Whose police? Our police! Whose police? Our police!" And another voice, desperate, rising out of the crowd: "No! No! They are not, they are not our police!" The exchange succinctly expresses two coexisting attitudes towards London's Metropolitan police, and indeed two functions of the police, perhaps everywhere, certainly in the city of London. The people who claimed the police as theirs posited a force that was in the service of the public, the citizen, the taxpayer (and not just the taxpayer, but those weakened and marginalised, those in need of protection). The voice that refuted this may have remembered other incidents, other times: a baton raised aloft, police horses charging, a man with a newspaper under his arm falling. In that context the inference was that the police are in the service not of the public, but of that slippery place where public office meets private gain: business, in this instance expressed by the soaring loop-the-loops of tax avoidance. In short they provided not our security, not common security, but that of someone else and someone powerful. Another familiar shout: "Shame on you! Shame on you! Shame on you!" But why appeal to a sense of shame, if the people in uniform do not serve the public? Recently on OurKingdom, Jon Burnett asked 'When will there be policing for black people in Britain?'. He says 'today... black and minority ethnic people are still suspect, even when they are victims, and anti-racism itself is increasingly being derided by the authorities as just another form of ‘extremism’'. Across the Atlantic in the US, people marched for justice for Trayvon Martin in their hundreds. Does their solidarity denote a faith that a civilian force that serves the cause of justice for all is possible? Who can build such a force - state institutions, civil society, government - and how? Routinely, peacebuilding missions in post-conflict and fragile states emphasise the creation of a police force as a move away from militarised societies, and towards a just peace. Where does the best practice that informs this come from, who delivers the training and builds the institutions, and whose interests do they serve? Over the past year openSecurity has looked at Security Sector Reform (SSR) as a challenge faced globally by states and civil societies struggling with the fundamental questions of what security is, and how – and if – it can be provided. Join us now as we focus on policing around the world – in the UK, Bahrain, the US, South Africa, India and Venezuela – each context different, yet each related. Policing is of course not all about protest. It’s about crime prevention, witness protection programmes, forensics, stop and search, response times, security agreements, daily bravery, daily abuses, corruption, and reform. But if we start with a clear understanding that the police forces of the world emerge out of particular political-economic and international relationships, we must return again and again to this question of "Whose police?"